As you might have heard, a new and awesome store is coming to town! 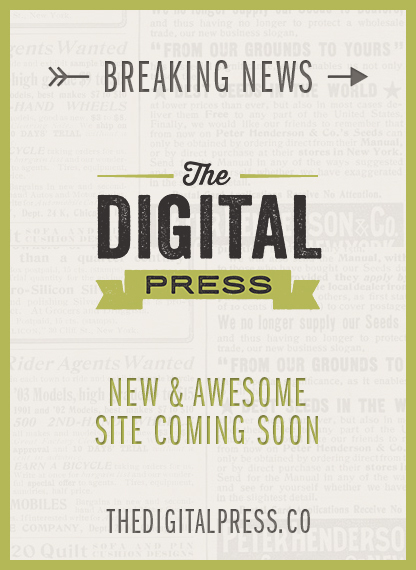 The Digital Press is going to be a great, quality store with an amazing line-up of designers! And I’m so excited to be part of it! My shop at P&Co has unfortunately already been disabled, but we are all hard at work to get the new store up and running soon! And… we’re off! Yet another DigiScrap Parade has launched! Besides my part of the Parade, I also have great deals and more freebies for you, so be sure to read through to the end! But first, here’s my contribution to The Scary Stuff! Just click on the image to download! Thanks for participating in the November 2014 DigiScrap Parade! If you’re following the Parade route from start to finish, you should have arrived here from Kelleigh Ratzlaff Designs and your next stop will be Mommyish. If you get lost along the way, simply head back to the main DigiScrap Parade site to view the master list and get back on track. And you can get these coordinating stamps FREE when you subscribe to the DSI newsletter! DSD is already in full swing at P&Co and I have some amazing deals for you! Through Sunday only you can ‘Pick Your Own Digital Scrapbook Ingredients’! Pick your favorite products from the DSI store and build your own grab bag for an incredibly low price! And my whole store is also on sale, so be sure to stop by! Have a great weekend and enjoy your new goodies! This week I have teamed up with the amazing Amber of Designs by Amber Shaw! We have created a fun kit chock full of awesomeness to celebrate everything good in your life! The Good Stuff is on sale for 30% off through Sunday!